I know we’re all thinking it, so I’ll just say it. That transition in the medley from Rush’s “Limelight” to “Paralyzer” by Finger Eleven was perhaps my smoothest ever, rivaling the transitions from the Scotland and West Africa episodes. Now that we’ve addressed that (brilliant) elephant in the room, lets talk about Canada. Our benevolent neighbors to the north. The land of hockey, curling, maple leaves, and an elected leader to make all others cry tears of jealousy (my views of politics are, as always, my own, and do not represent those of Hendrix College). But seriously, it is hard to not love Justin Trudeau. The man literally does it all. Interestingly enough, he is listed on the wikipedia page for “Strongmen” — leaders of nations who have been particularly powerful or influential, occasionally with a negative connotation (i.e. dictators), but there can be good ones as well. Under the list for Canada, there were only two leaders listed as strongmen: Justin Trudeau and his father, Pierre Trudeau. While I don’t know a lot of Canadian politics (I learned it during my junior year of high school, but if you had the teacher I had, you’d understand why it didn’t stick), I do know that Pierre Trudeau had quite a tough reputation. Like father like son? 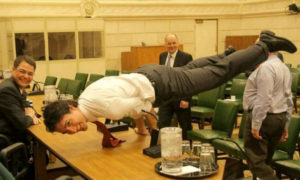 Either way, with how the administration here is, I don’t blame Justin for feeling the need to be tough in his stances. The world needs it right now. The millions he has pledged to women’s reproductive rights is such a wonderful news item to receive, and I really hope he can continue to be a shining light in a time of political confusion and darkness. And while I’m still on the subject, I love how the term for a powerful and commanding leader is strongman. Because of course, testosterone is perhaps the only requirement for a good leader, right? Right. On that note, take a listen to our show if you haven’t already, and I’ll link the playlist too. Thanks for reading!